Have you been considering a kitchen remodel but confused about what it will cost? Today I tackle that elusive topic using industry accepted data to help you come up with a realistic budget. According to Remodeling Magazine’s 2018 Cost vs. Value Report, upscale kitchen remodels average more than a 50% return on investment, while a mid-range minor remodel can yield higher than 80% return on investment. Numbers aside, having a functional and beautiful kitchen you, your family, and guests can enjoy for years, is simply something you can't put a price on. 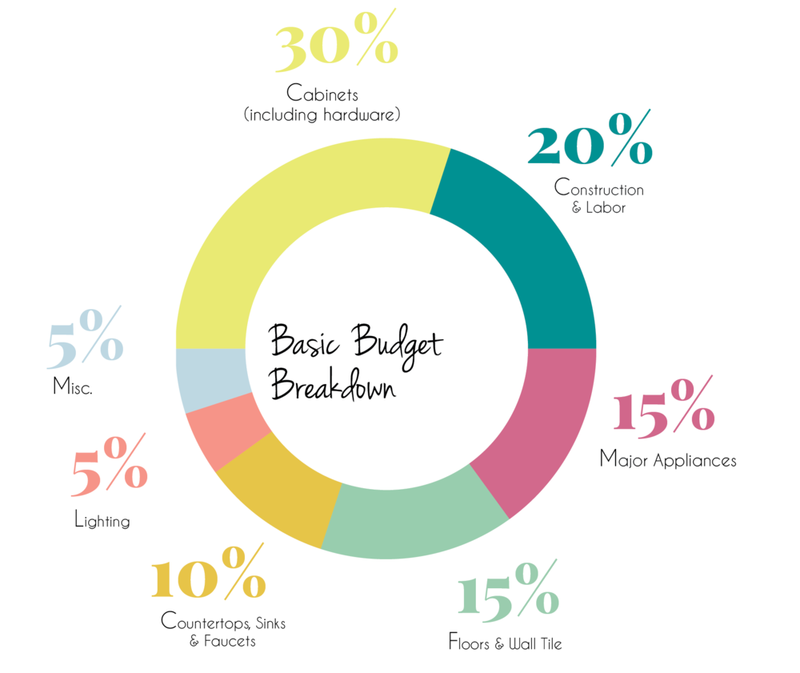 Today I'll share a basic budget breakdown, then what you can expect with a Basic, Mid-level, and Premium Kitchen remodel. I would add there is another level, which I call a luxury kitchen renovation, which we will not be discussing here. Most projects fall between the Mid-level and Premium budget range. Remodeling costs vary by region so begin by researching the numbers in your area and come up with a budget number that you feel comfortable with. Be sure to add 20% for unforeseen issues that inevitably come up. Now let's take a look at how you might allocate that money and what you can expect in the three levels outlined above. #1 What are your quality expectations? If you know you have a penchant for finer things, don't expect that to change when it comes to selecting quality finishes for your kitchen. Take a good look at your closet and garage to best reflect your expectations. Two 300sf kitchens can have wildly different price tags based on the chosen finishes. #2 How big is your kitchen? Square footage is the second biggest factor in determining a realistic budget. There are baseline costs that can't be ignored. Bottom line, the bigger the kitchen, the bigger the price tag. Use this chart above as a general guide but make it your own. If you fall in love with a beautiful backsplash tile or a gorgeous chandelier, maybe you decide you're willing to DIY the demo work to reallocate that money toward your tile or lighting budget. Semi-custom cabinets - Averages $150-$250 per linear foot. Typically comes in 3" increments so you can have more precise configurations without a lot of filler pieces. Plan to DIY most of the work. Leave electrical and plumbing to the professionals. Always work with a licensed insured pro and ask for recommendations from past clients. Don't DIY the cabinetry paint. A pro should paint the doors in a professional spray environment that prevents hair, debris, etc. from sticking to wet paint. Always use the right paint for the job. I recommend Benjamin Moore's Advance paint which is engineered for painting cabinetry and furniture. It drys hard and with proper clear coat, will not easily chip or scratch. Plan to hire more help. Save money by doing your own demo work. Purchase white appliances which tend to be less expensive than their stainless counterparts. Buy a suite of appliances - If you don't mix, consider buying all from the same line which are often discounted when bundled. Time your renovation so you can take advantage of Black Friday deals. Look into integrated panel-ready appliances such as refrigerators and dishwashers that blend with the cabinetry for a custom look. Can play with inset tile "rugs"
Level 2 lighting on basic such as island pendants, or over sink light. Under cabinet lighting and/or cove lighting.